This is a line and a delivery that has been stuck in my head a lot lately. And I want to keep it there. I happen to have a snarky voice in my head from time-to-time. When I was a teenager they called me Miss Snide–in the minefield of high school, sarcasm is sometimes the best defense. And this voice lingers in my head, right into middle age. It’s a sarcastic, and often, sadly, a judgmental voice. Society is to blame! We live in a world full of petty criticisms, mean anonymous comments, articles that rate people and compare people and criticize their every move. I try to hold the voice in check. I don’t want to waste my time in being critical of trivial things. I believe that people should be able to wear what they want to wear, say what they want to say, and act how they want to act, as long as it doesn’t hurt anybody else. I want to be generous and affectionate all the time. But I’m not, I’m just not. So, lately, when I feel myself being snidely critical of some small thing a person does or says or wears, I imagine Katherine Hepburn, paper cup of champagne in the air, declaring, “More power to you!” If every single cruel and acidic comment on the old internet could be replaced with “More power to you!” Well, that wouldn’t be so bad. More power to you! More power to each and every one of you! 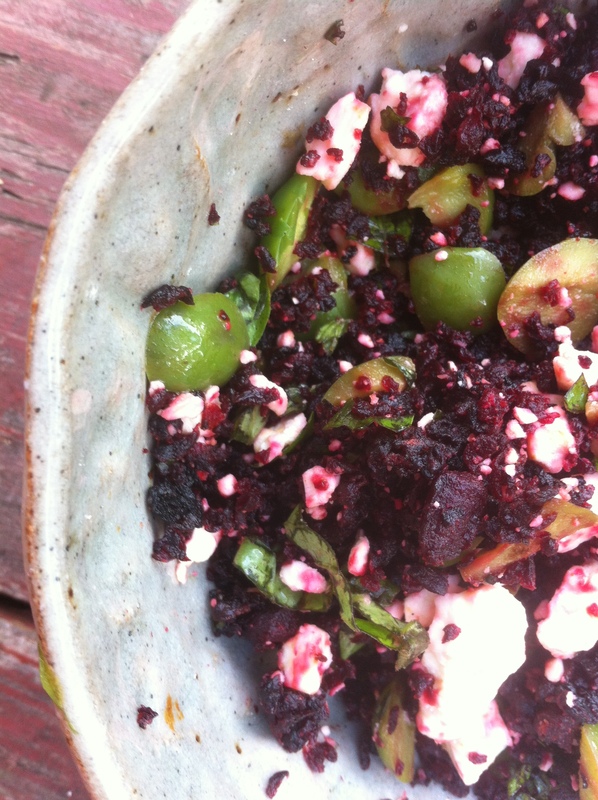 I made this earlier in the summer, but since beets are making a come back at the farm, I’m posting the recipe now. More power to me! It’s an easy recipe, with lots of strong flavors, but most of the children I fed it to liked it. It’s almost like a relish, because the beets are chopped so finely, so you can have it on the side of anything, or on some good bread, or however you like to eat it. Preheat the oven to 425. Chop the beets very fine. I used the food processor. I cut each beet into large chunks, put it all in the food processor and give it 4 or 5 long pulses. You want it to be finely chopped but not puréed. Toss the beets with enough olive to coat and spread in a single layer on a baking sheet. Roast until browned and crispy, about 20 minutes. They’ll start to smell caramelized. Stir and toss frequently so that they brown evenly. Scrape into a bowl. Add all of the other ingredients and mix well. Serve! 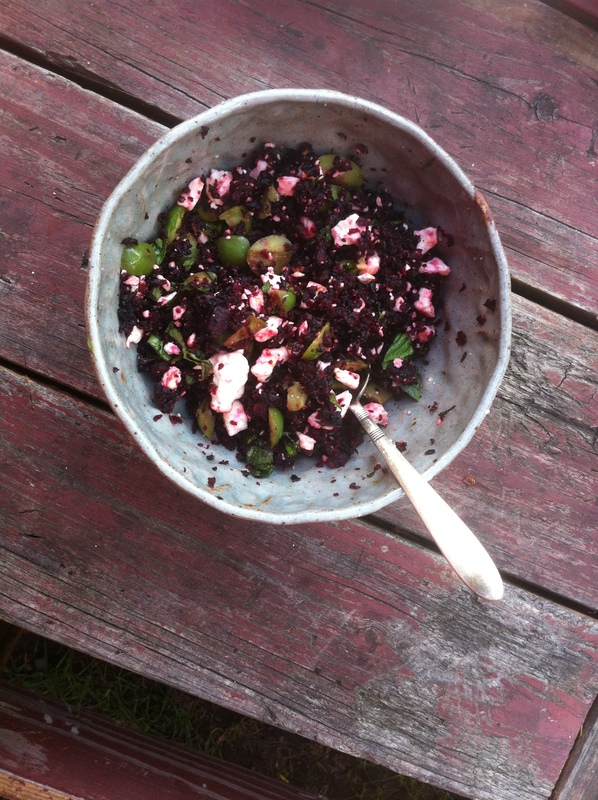 This entry was posted in appetizer and tagged beet relish, beets, french feta, olives, roasted beets by Claire. Bookmark the permalink. I made both of these recipes – we loved them both. I used walnuts instead of pine nuts – couldn’t find where I had hidden them and walnuts go well with beets anyway. Think I will also roast a bunch of thin-sliced beets with a little salt and olive oil for snacking – thanks for the idea!